In a city that supposedly caters to every culinary whim, decent Mexican food is surprisingly difficult to find. Difficult—but not impossible. You just need to know where to look. 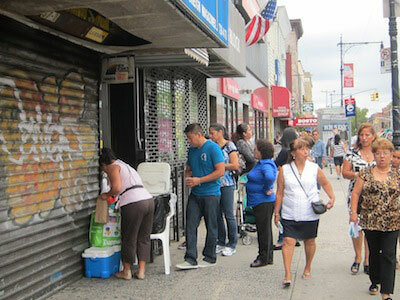 Taco-lovers usually flock to Bushwick, Corona, Jackson Heights, or Sunset Park in search of their fix. 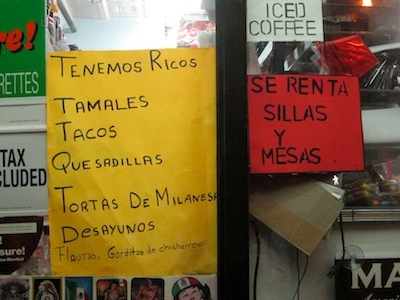 But we wanted to see if we could find great tacos and other antojitos (Mexican snacks) closer to home—in Astoria, Queens. 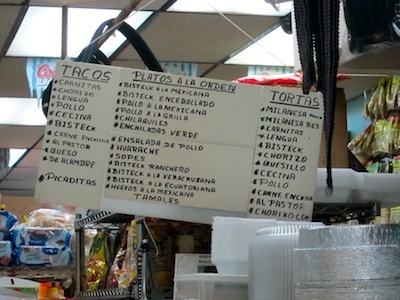 So we spent a good bit of the summer trolling Astoria’s unassuming bodegas and taquerias in search of exceptionally good tacos, sopes, huaraches, tamales, and the like. The pickins were good, and now we sing the praises of the best of Astoria’s under-appreciated Mexican fare. 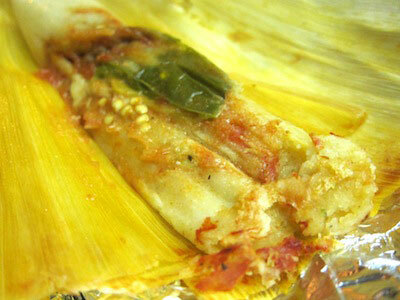 UPDATE 2/11/13: The tamale lady, Socorro Carranza, is open for business on Thursday, Friday, Saturday, and Sunday mornings. Stumble down Broadway on a Sunday morning and you may find a woman with a granny cart stacked with coolers parked under the Delgado Travel sign. It may not look like much, but those coolers are filled with homemade tamales, arroz con leche, and champurrado. All the tamales pack a creamy, semi-grainy, moist masa. In the core, you’ll find simple, well-seasoned, carefully prepared fillings. The arroz con leche, a 50/50 mix of milky liquid and actual grains of rice, is creamy with a touch of vanilla and cinnamon. 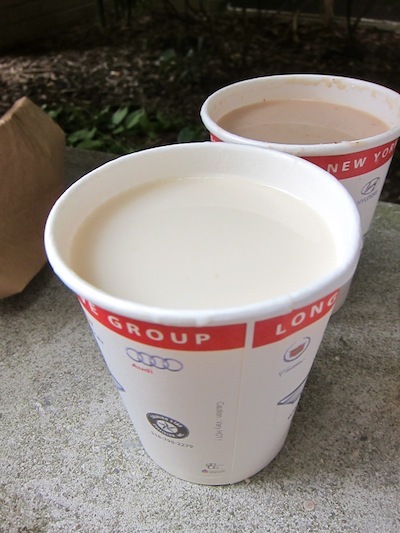 The champurrado, a hot chocolate-like drink thickened with corn flour, is indeed thick and very sweet. Both were served steaming hot. 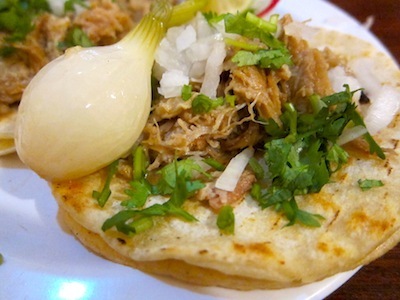 At $1.25 a pop for everything—tamales and desserts alike—this home-cooked street food is a steal. Get there early because the action ends when the goods sell out. Cruise by at 11:30am, and you’ll likely find no trace of these amazing tamales and sweet treats. The incredibly friendly men working the small grill in this unassuming bodega—all smiles and Spanish greetings—have made La Cabana our new home-away-from-home. It doesn’t hurt that their food is flavor-maxed, to boot. 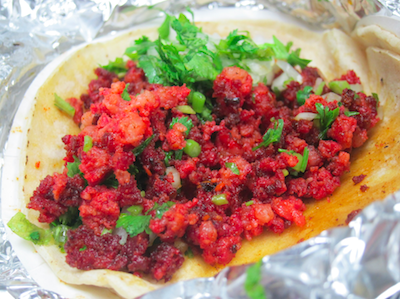 The chorizo taco ($2), filled—almost exploding—with expertly cooked, fiery red sausage is hands-down the best in Astoria. The doubled-up tortillas cradling this mound of meaty goodness are soft, grill-marked, and piping hot. The simple toppings (fresh cilantro and diced onion) are all this taco needs to sing. La Cabana’s creamy salsa verde packs legitimate heat, but save it for the queso taco ($2), a true winner for vegetarians. This taco, another simple masterpiece, combines a grilled slab of creamy queso blanco with fresh cilantro and diced onion. 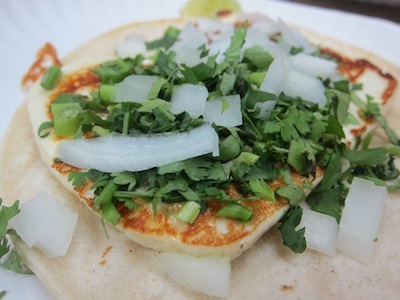 This may just be our favorite vegetarian taco in the city. Pork and jalapeno and cheese and jalapeno tamales are offered daily at La Cabana. 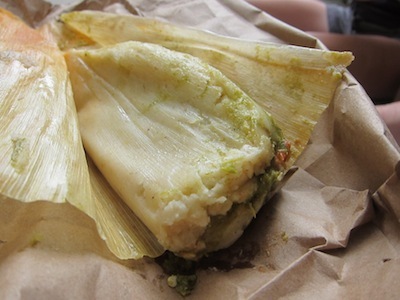 Skip these and try the enormous tamal Oaxaqueño ($2.50), which is stuffed with moist, tender chicken and salsa verde, then steamed in a banana leaf. The masa is slightly dry, but it’s exceptionally flavorful (with hints of banana) without resorting to excessive fat. 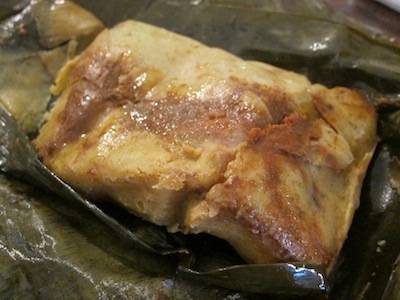 The best bits are along the underbelly of this tamal, where the masa has absorbed the juices of the chicken. You’ll find an array of Mexican sodas and horchata by the carton, as well as chorizo and several kinds of cheese in the refrigerator section. The steam table also has home-style chicken, pork, and fish dishes, and there’s small seating area where you can eat your food piping hot. Take a seat at La Espiguita’a old-school lunch counter and watch the short-order cooks (who clearly know a thing or two about working a grill) pack Styrofoam containers to the brim with delights ranging from epic-size huaraches and sopes to pernil horneado (roast pork) or barbacoa (barbecued goat; weekends only). 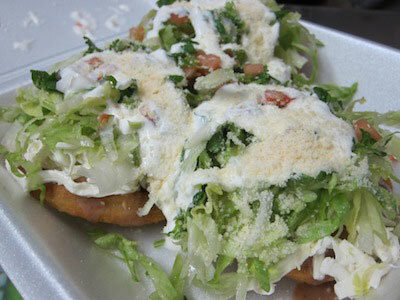 We went for the chorizo taco ($2.25) and the sopes ($3). 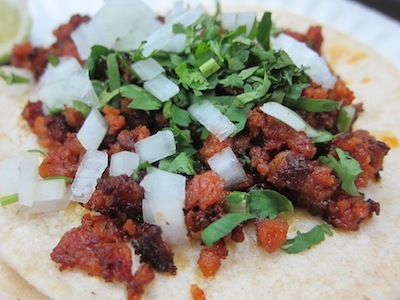 The sausage, served piping hot (so many chorizo tacos are served room-temperature! ), is spicy, crunchy—with some softer bites, and satisfyingly oily. 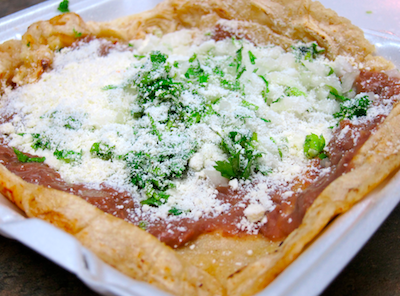 La Espiguita’s owners hail from Mexico City, and their hometown evidently influences their sopes, which are served as a single, enormous disk of masa—much like Mexico City’s famous street food, huaraches. After we placed our order, we watched the grill man make the thick masa base from scratch. Topped only with refried beans, diced onion, cilantro, and crumbly, creamy queso molido, these vegetarian sopes are simple but amazingly flavorful—easily our favorite in Astoria. 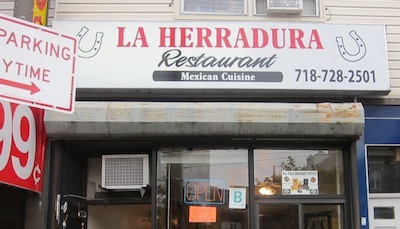 Not far from the south side of Astoria Park is La Herradura, a charming gem on Astoria Blvd.’s strip of Mexican bodegas and restaurants. 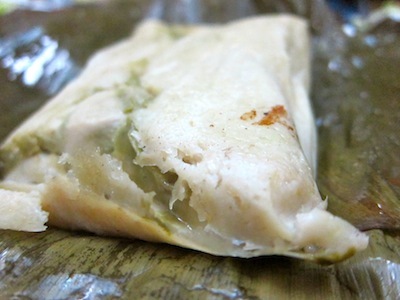 A specialty at La Herradura is the tamal Oaxaqueño ($2.50), an enormous packet that arrives at the table wrapped in an oil-slicked banana leaf. Big is, indeed, beautiful. Peel open the banana leaf and you’ll find a mound of smooth, moist masa bursting with rich, spicy brownish-red mole. Buried within are juicy hunks of pork and fat. 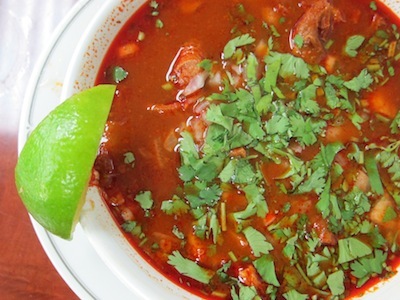 That’s right—juicy, fatty pork simmered in spicy mole sauce. Need we say more? The mostly meaty menu options and even meatier steam table specials are a daunting challenge for vegetarians. 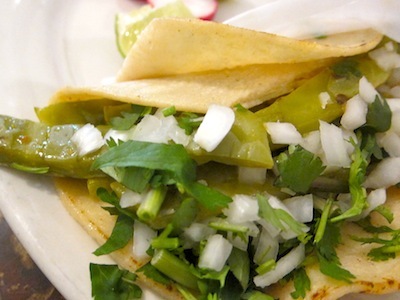 But never fear—if you ask for a nopales taco ($2.50; off-menu), you’ll receive a very decent version, topped with freshly grilled nopales (cactus), cilantro, diced onion, and lime. 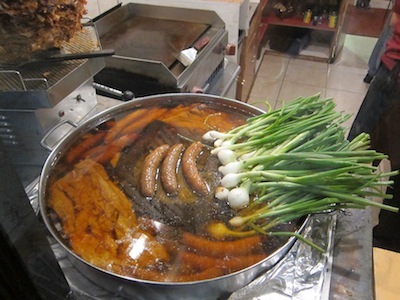 The front window at Los Portales features an oil-filled cauldron stocked with slowly simmering chorizo, veal flank, and green onions (bulbs still on)—a spectacle that hints at the restaurant’s gloriously rich antojitos. Los Portales’ veal flank tacos ($1.50 each) are smaller than most, but the flavor trapped in those tender shredded pieces of meat is mind-blowing. The veal is mouthwatering, salty, and fatty (in the best possible way). One, small hit is all you need, though you’ll definitely want to come back for more. The potent house-made salsa verde, our favorite in Astoria, adds a spicy, garlicky kick. 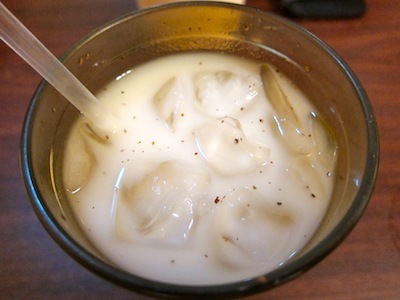 Wash it all down with a wonton-soup-size container of chilled horchata ($5). Thin (as it should be), mildly sweet, pleasantly spiced, and ice-cold, it’s a delicious way to beat the summer heat. Don’t be fooled by the name. The bagels at this deli take a back seat to its true specialty: Mexican home cooking. If you’re a meat-lover, don’t miss the enormous steam table. Especially on weekend mornings, it’s lined with huge pans filled with vibrantly colored Mexican comfort food—ribs in salsa verde, roasted goat, beef tripe stew, chicken in mole, red and green chilaquiles, nopales and egg, and chorizo and potato hash. The hardest part: Deciding what to eat. You can also order freshly made tacos and tortas (Mexican sandwiches brimming with meaty goodness of your choice and topped with cheese, avocado, tomatoes, jalapeño, and mayo), as well as tamales (Friday-Sunday only). 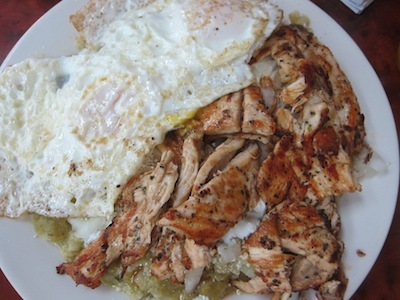 We went for the green chilaquiles with chicken and eggs (if you’re vegetarian, just place your order “sin pollo”). Lopped onto our plate cafeteria-style, these chilaquiles are super soft, spicy, comforting, and creamy. The tortilla bits and flavorful salsa verde are married to one another in a thick coating of crema—unlike other chilaquiles we’ve tried, which were slightly crunchier. We also tried a small bowl of the beef tripe stew (available daily on the steam table), which combines bits of tender tripe, clearly cooked with love (and no small amount of expertise), with a tangy, fiery red broth. Top it all off with some lime juice, cilantro, and diced onion for added texture and a zesty kick. 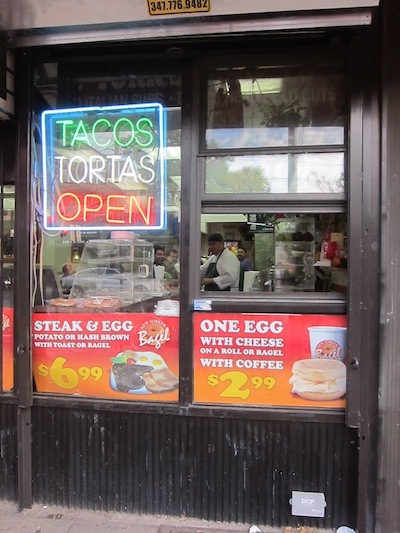 This bodega’s Anglo name belies the Mexican specialties available within. Its small kitchen churns out tacos, tortas, and tamales daily (a steam table is also in the works), and there’s a good selection of tamarind- and coconut-based sweets, Mexican baked goods, and a full stock of dried herbs and spices. If you love breakfast-for-dinner (as we do), don’t miss the egg-laden tacos—one served with meat, the other vegetarian. 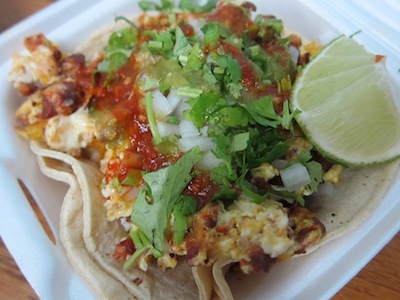 The chorizo con huevos taco, topped with red and green salsas, diced onion, and cilantro, is piled so high with sausage and scrambled eggs that you’ll have to eat away at the mound before even attempting to lift the taco and take a bite. The eggs, soft and speckled with chunks of chorizo, are moist and flavorful. 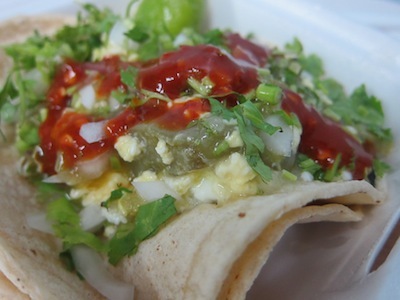 The vegetarian variant, the nopales con huevos taco, is equally overloaded with eggs and cactus bits. The tangy cactus and subtly spicy salsas offer an ideal contrast to the creamy scrambled eggs. 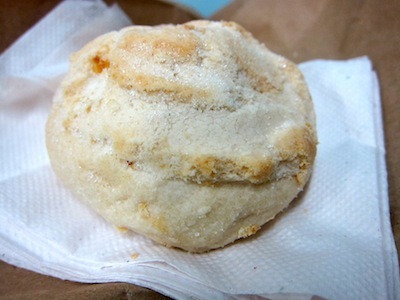 End your visit with homemade polvorones ($1), made by a local woman who sells her Mexican baked goods at St. James. These buttery cookies look like mini-scones, but with hard outer-shells, dense, almost powdery interiors, and a mildly sweet flavor that would complement a piping hot champurrado on a cold morning. Yelpers rave about the tacos at this popular bodega, but don’t miss the well-seasoned, soft, and moist chicken and jalapeno tamales ($1.50), available daily. If you’re looking for something more substantial, try the trio of rich quesillo sopes, layered with refried beans, creamy strings of quesillo cheese, lettuce, red onion, tomato, and cilantro, then topped with ample crema and a dusting of sharply flavored cotija cheese. The fried masa disks underneath it all are thick and crispy enough to support that small army of toppings without getting soggy. 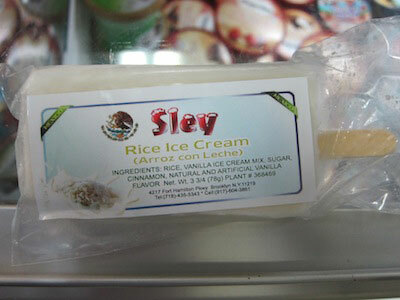 If you’re looking for something sweet or cool, try one of the many Mexican ice pops ($1.75), which come in flavors like arroz con leche, mamey, and even egg nog. A small steam table operates early in the day, and there are tables in the back for eating—though we prefer to sit outside on the trio of chairs near the door and take in the foot traffic along this off-the-beaten-path stretch of 31st Ave. Follow all of Tina Corrado’s culinary explorations at her blog, Tina’s Nom Noms. 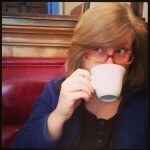 Follow Sue Yacka and her eating adventures via twitter at @tastoriaqueens. Great reviews – thank you for posting them. I have been to most of these, but will check out the rest. I do feel obligated to point out, however, that the St. James Deli is not a place any decent person should be patronizing. I used to go there all the time – they have amazing food, but as the two posts below demonstrate – they have really poor judgment. I miss their food, but would never give them a penny again. Thanks for the list. It’s like you’ve done all the work so I don’t have to. We just had a wonderful meal at La Herradura (21-09 Astoria Blvd.). Delicious and cheap. I’ll probably try the rest eventually, but maybe not. Herradura was by far the best Mexican I’ve had in Astoria. The tamal Oaxaqueño was the best tamale I’ve ever had. Admittedly I’m not a big tamale fan, but this was so moist and *without* crumb — almost like a pudding. Like no other tamale I’ve had. Delicious. The mole was very good. The guacamole seemed kind of bland at first but grew on us. Very little in it but perfectly ripe avocado… and there’s nothing wrong with that. The black beans were lard-a-licious! We brought in beer from the bodega next door and dinner for three came out to just $28(!). $10/person in NYC? So cheap I thought they had made a mistake, but no. In the back of the mexican bakery on 30th ave between Crescent and 29th (right by mt sinai, if you need a landmark) is a really great place too, called El Molcajete. It’s a taqueria/restaurant within a bakery. Thumbs up for huitlacoche on the menu, got in in the quesadilla. This is really helpful. I needed some hole in the wall places to enjoy tacos. Good selection and many choices, thanks everyone! Hey thanks for this posting! Not only they sell all kinds of Mexican products and ingredients but they also have a tiny sitting area at the back where you can get the real deal: Tacos, Groditas, Enchiladas, Burritos, tortas, etc. I strongly recommend the ‘Gorditas de carne enchilada and ‘tacos de cecina’. My wife and I are big fans of this place and sometimes even get the food delivered to our house (you have to call and find out if they have delivery though, but worst case you can always call in advance and pick it up). 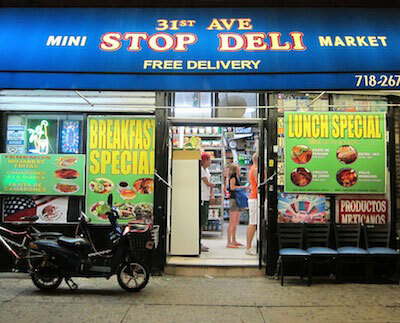 Health department closed down Stop Deli.